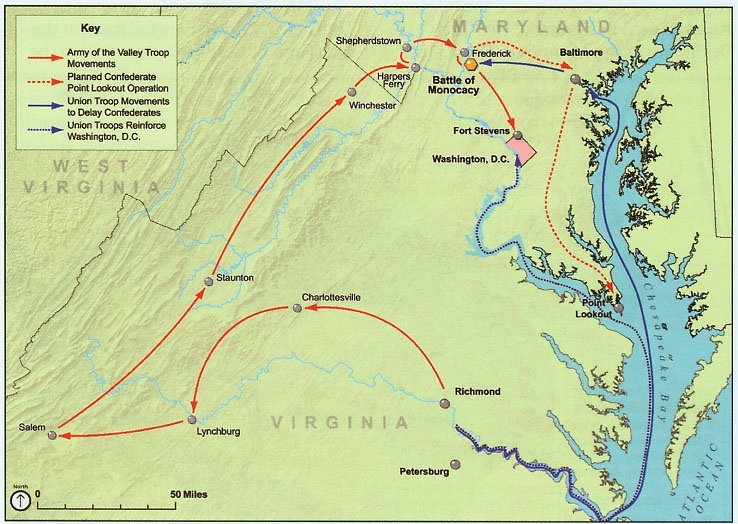 The Battle of Fort Stevens, also known as Battle of Washington City, was one of the many battles that had been contested during the Shenandoah Valley Campaigns of 1864. While Fort Stevens shielded the nation's capitol, it was also here that President Abraham Lincoln could be seen standing tall while studying the Rebel ranks as they pressed near. It was a "demonstration before Washington," Early would recall, but the Confederate general had hoped for more. 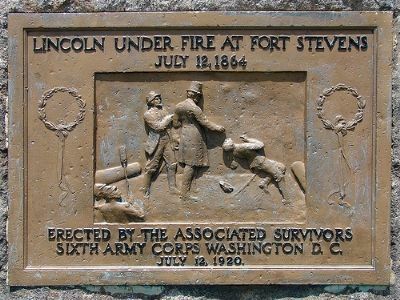 The Battle of Fort Stevens was fought July 11–12, 1864, in northwest Washington, D.C., as part of the Valley Campaigns of 1864 between forces under Confederate Lt. Gen. Jubal A. Early and Union Maj. Gen. Alexander McD. McCook. Although Early caused consternation in the Union government, reinforcements under Maj. Gen. Horatio G. Wright and the strong defenses of Fort Stevens minimized the military threat and Early withdrew after two days of skirmishing without attempting any serious assaults. The battle is noted for the personal presence of President Abraham Lincoln observing the fighting. From the north, Fort Stevens was the main thoroughfare into Washington from the 7th Street Pike (now Georgia Avenue). Partially restored, the fort is currently located at 13th and Quackenbos Streets, NW. It was originally referred to as Fort Massachusetts because the soldiers who constructed it the formidable works were from Massachusetts. It was later renamed after Brigadier General Isaac Ingalls Stevens, who had been killed at the Battle of Chantilly, Virginia, September 1, 1862. The two capitals during the Civil War were nearly 110 miles apart, and they were so close it appeared as though each side had dared or perhaps invited the other to test its strength. Both capitals became large battlefields where many men would struggle to the death while striving to defend its nation's headquarters. Each was the crown jewel to the other, and each was to protect its national symbol at all hazards. The Confederate commanders had patiently awaited that single opportunity to sack Washington while also hand delivering to Lincoln papers requiring his signature to recognize the newly formed Confederate States of America. They believed that opportunity presented itself during the summer of 1864. In the summer of 1864, General Ulysses S. Grant, during the Siege of Petersburg, had Confederate General Robert E. Lee in a deathtrap around Richmond and Petersburg. When General Grant had moved south, he stripped Washington, D.C., of many well trained troops. When Grant assumed command of all Union forces in 1864, a plan, which read more like a vice crushing a walnut, was soon implemented that would have dire consequences for Lee and the fledgling Confederate nation. Banks was to press Mobile, Sherman to plow through a howling Georgia, Sheridan would sweep the Shenandoah Valley, that bread basket of the South, and then the Union generals were to all link up with Grant, who was opposite Lee and dug into trenches for nearly 10 months along Petersburg and Richmond. The trenches would become common place in the First World War, but for the United States, it was something that had never been seen nor experienced. As a result of July 1864, there were only 9,000 troops to defend the city; down from more than 23,000 that had been there the previous year. The troops that remained were primarily poorly trained reserves. 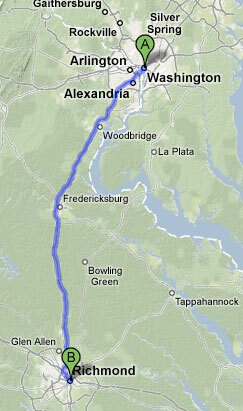 General Lee sought desperately a way out of his predicament around Petersburg. He decided to order General Jubal A. Early with about 20,000 troops, aka the Army of the Valley, to strike at Washington; since his spies had reported it was poorly defended. (Right) Fort Stevens was named after Union Brig. 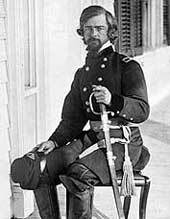 Gen. Isaac Ingalls Stevens, who was killed at the Battle of Chantilly, Virginia, September 1, 1862. As a result of the rapid and successful movement of General Early, the War Department seemed paralyzed and gave no orders. General Grant understood the situation and forwarded the 25th New York Cavalry, which left City Point, Virginia, on July 7 and reached Fort Stevens midnight of July 10. Also on the 7th, the 1st and 2nd Divisions of the VI Corps, commanded by General Horatio G. Wright, departed City Point. A few hours later, General W. H. Emory, with part of the XIX Corps (just returning from New Orleans to join Grant) departed Fort Monroe for Washington. By noon of July 11, General Early was in full view of Fort Stevens, reconnoitered the area, and found the fort poorly manned. During the afternoon, General Early tried to find a weak spot in the line, but supporting Fort Stevens were the guns from Fort DeRussy on the left and Fort Slocum on the right. (Right) Detachment of Company K, 3rd Massachusetts Heavy Artillery by guns, Fort Stevens. Interesting Fact: "As early as the 1820s, free African Americans settled in a community named Vinegar Hill, an area now known as Brightwood. During the Civil War, Fort Stevens was built within Vinegar Hill boundaries and repulsed the only Confederate attack on the District of Columbia." When examining the works at daylight on July 12, Early saw the parapets lined with seasoned troops; he then decided to abandon the idea of capturing Washington. By nightfall of July 12, the Rebels withdrew and the Union Capitol had been saved. According to Frances H. Kennedy, The Civil War Battlefield Guide, 2nd ed., Houghton Mifflin Co., 1998, the estimated Union casualties were 373, while the Confederate losses were approximately 500. 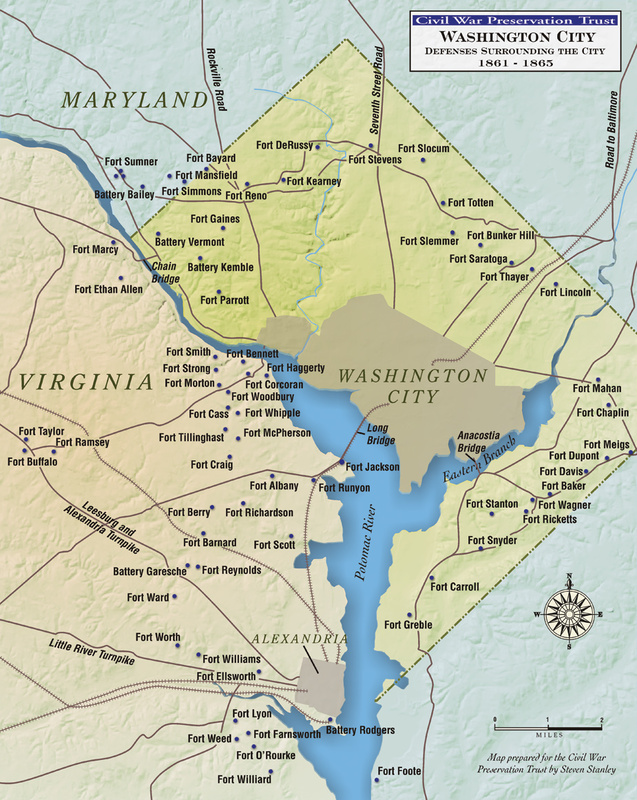 In 1860, Washington, D.C., (known as Washington City at the time) sat almost completely unprotected, with Fort Washington, the lone fortification, being 12 miles south. Virginia, a Confederate state, lay on one side of the city, and Maryland, a slave-owning state, was on the other, leaving Washington dangerously vulnerable. Washington in 1860. National Archives. (About) President Lincoln insisted that construction of the U.S. Capitol continue during the Civil War. Realizing the potential danger the city faced, the Union army constructed additional fortifications for the city. By 1865, the Defenses of Washington included 68 forts, supported by 93 detached batteries for field guns, 20 miles of rifle pits, and covered ways, wooden blockhouses at three key points, 32 miles of military roads, several stockaded bridgeheads, and four picket stations. Along the circumference of the 37-mile circle of fortifications were emplacements for a total of 1501 field and siege guns of which 807 guns and 98 mortars were in place. The defenseless city of 1860 had become one of the most heavily fortified cities of the world. 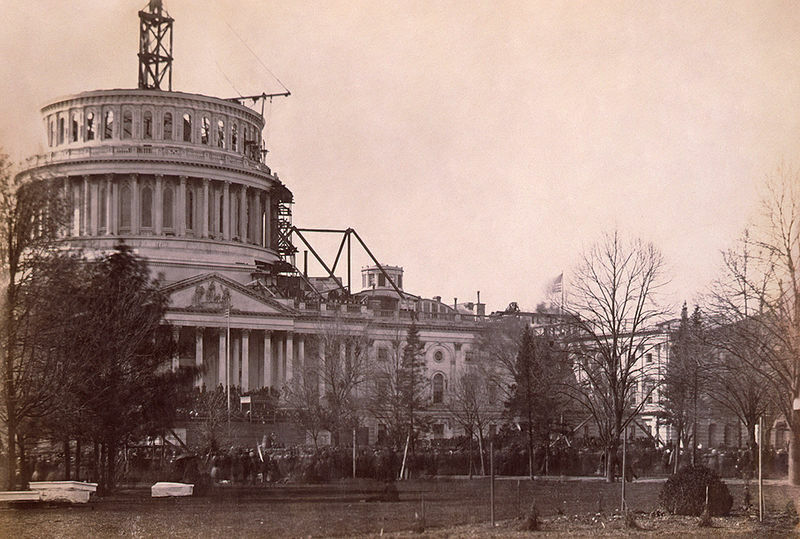 (Left) Photograph of the Capitol Building under construction in 1861 during the Civil War. Library of Congress. In 1860, the Union Capitol, Washington, D.C., was a sleepy city with 75,080 residents. In 1860, 80.9% were white, and 19.1% were black. According to the 1870 US Census, however, the city embraced 131,700 residents (67.0%: white; 33.0%: black). Not only did the defenses serve their purpose well by deterring Confederate attack on the capitol, but they impacted the city culturally, socially, and politically. For example, many enslaved people came to the fort system for protection and settled nearby, changing the cultural landscape of the city. The population doubled in less than five years and changed in character from southern origin to northern newcomers. The physical landscape was drastically affected, as well. Miles and miles of trees and many buildings were razed to construct the defense system--creating a fort-capped circle around the city. 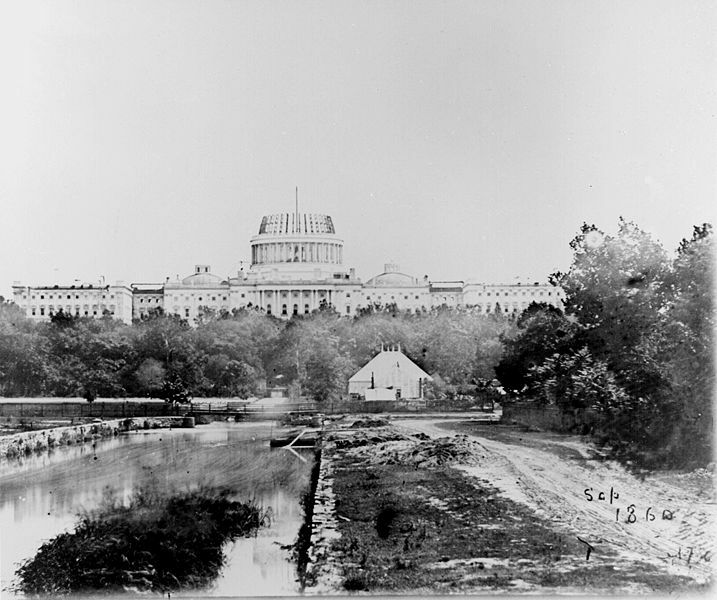 The nation's capitol in 1861. Library of Congress. 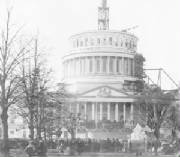 (About) Photograph of inauguration of Abraham Lincoln, March 4, 1861, beneath the unfinished dome of the Capitol. Hospitals in the Washington area became significant providers of medical services to wounded soldiers needing long-term care after being transported to the city from the front lines. Among the most significant of these Civil War hospitals were the Armory Square Hospital, Finley Hospital, and the Campbell Hospital. More than 20,000 injured or ill soldiers received treatment in an array of permanent and temporary hospitals in the capitol, including the U.S. Patent Office, and, for a time, the capitol itself. Among the notables who served as nurses or medical assistants were poet Walt Whitman, American Red Cross founder Clara Barton, and Dorothea Dix. Novelist Louisa May Alcott served at a hospital in Georgetown. The United States Sanitary Commission had a significant presence in Washington, as did the United States Christian Commission and other relief agencies. The Freedman's Hospital was established in 1862 to serve the needs of the growing population of freed slaves. (Right) "When Johnny Comes Marching Home Again, Hurrah, Hurrah!" 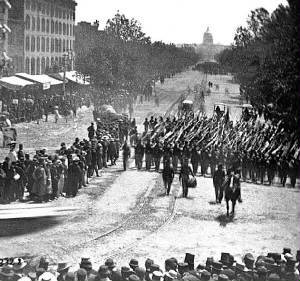 Union soldiers at the end of the Civil War march down Pennsylvania Avenue in 1865. The infantry soldiers marched with fixed bayonets and were followed by ambulances passing on Pennsylvania Avenue near the Treasury. Library of Congress. As the war progressed, the overcrowding severely strained the city's water supply. The Army Corps of Engineers constructed a new aqueduct that brought 10,000 gallons of fresh water to the city each day. Increasing Police and fire protection, work resumed to complete the unfinished dome of the Capitol Building. However, for most of the war, Washington suffered from unpaved streets, poor sanitation and garbage collection, swarms of mosquitoes facilitated by the dank canals and sewers, and poor ventilation in most public (and private) buildings. Important political and military prisoners were often housed in the Old Capitol Prison in Washington, including accused spies Rose Greenhow and Belle Boyd, as well as partisan ranger John S. Mosby. One inmate, Henry Wirz, the commandant of the Andersonville Prison in Georgia was hanged in the yard of the prison shortly after the war for his cruelty and neglect toward the Union prisoners of war. 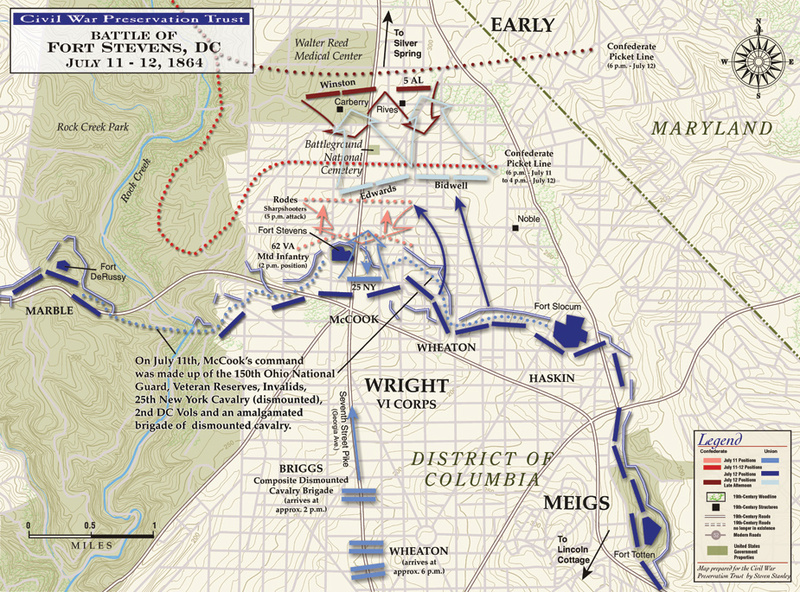 Continue to Battle of Washington / Fort Stevens: Overview. Recommended Reading: Season of Fire: The Confederate Strike on Washington (Hardcover: 300 pages). Editorial Review from Booklist: In 1864, Confederate General Jubal Early, outraged by Union depredations in the Shenandoah Valley by the Federals, launched a bold but futile raid on the outskirts of Washington, D.C. With this event as the central focus of his narrative, Judge has written a fascinating and riveting account of the men in battle. He masterfully maintains both dramatic tension and historical accuracy by relating the events through the memoirs of the actual participants. Judge explains the military maneuvers in language that laypersons can easily grasp, and his portrayals of the key participants breathe life into the account. Continued below. In fact, Cooling's greatest contribution may be his clear demonstration that Grant was fooled by Early's operations and took an uncommonly long time to react to a very serious threat." - American Historical Review." About the Author: B.F. Cooling is chief historian of the Department of Energy and has won the Douglas Southall Freeman Award and the Fletcher Pratt Award for best Civil War history book. It's the "Capitol" that you have never really seen or heard that much about... It's a scrappy, dusty, muddy, unfinished city, begging for respect. Washington City, as it was called then, was both a respite for Union soldiers, as well as the Union Army’s “prostitution headquarters.” From the so-called 'highlife to the lowlife', the politician to the pauper, all receive their respectful, or rightful, place in this delightful but candid prose. Here among the sharpsters and prostitutes, slaves and statesmen are detective Allan Pinkerton, tracking down Southern sympathizers; poet Walt Whitman, nursing the wounded; and accused Confederate spy Antonia Ford, romancing her captor, Union Major Joseph Willard. Here are generals George McClellan and Ulysses S. Grant, railroad crew boss Andrew Carnegie, and architect Thomas Walter, striving to finish the Capitol dome. And here is Abraham Lincoln, wrangling with officers, pardoning deserters, and inspiring the nation. Freedom Rising is a gripping account of the era that transformed Washington into the world’s most influential city. This work covers the entire year of 1864 so that readers can clearly see how one event led to another in the Shenandoah Valley and turned once-peaceful garden spots into gory battlefields. It tells the stories of the great leaders, ordinary men, innocent civilians, and armies large and small taking part in battles at New Market, Chambersburg, Winchester, Fisher’s Hill and Cedar Creek, but it primarily tells the stories of the soldiers, Union and Confederate, who were willing to risk their lives for their beliefs. The author has made extensive use of memoirs, letters and reports written by the soldiers of both sides who fought in the Shenandoah Valley in 1864. The eleven essays in this volume reexamine common assumptions about the campaign, its major figures, and its significance. Taking advantage of the most recent scholarship and a wide range of primary sources, contributors examine strategy and tactics, the performances of key commanders on each side, the campaign's political repercussions, and the experiences of civilians caught in the path of the armies. The authors do not always agree with one another, but, taken together, their essays highlight important connections between the home front and the battlefield, as well as ways in which military affairs, civilian experiences, and politics played off one another during the campaign. Sources: National Park Service; Library of Congress; Official Records of the Union and Confederate Armies; Diary and Memoirs of Lt. Col. William Williams Stringfield; Civil War Preservation Trust; US Census Bureau; National Archives; Catton, Bruce, Army of the Potomac: Mr. Lincoln's Army, Doubleday and Company, 1961; Eicher, John H., and Eicher, David J., Civil War High Commands, Stanford University Press, 2001, ISBN 0-8047-3641-3; Furgurson, Ernest B., Freedom Rising : Washington In The Civil War, New York: Alfred A. Knopf, 2004. ISBN 9780375404542; Kennedy, Frances H., ed., The Civil War Battlefield Guide, 2nd ed., Houghton Mifflin Co., 1998, ISBN 0-395-74012-6; Laas, Virginia Jeans, ed., Wartime Washington : The Civil War Letters of Elizabeth Blair Lee, University of Illinois Press, 1999. ISBN 9780252068591; Leech, Margaret, Reveille in Washington: 1860 – 1865, Harper and Brothers, 1941. ISBN 9781931313230; Leepson, Marc, Desperate Engagement: How a Little-Known Civil War Battle Saved Washington, D.C., and Changed The Course Of American History, Thomas Dunne Books, 2007. ISBN 9780312363642; Wert, Jeffry D., General James Longstreet: The Confederacy's Most Controversial Soldier: A Biography, Simon & Schuster, 1993, ISBN 0-671-70921-6.